Wheelchair / Scooter Foam Torso Support Stops Slumping. 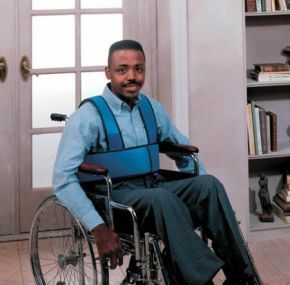 This wheelchair / scooter torso support is ideal for those who tend to slump forward in wheelchairs. Fully adjustable to fit most users. Made of soft, breathable foam with 635mm (25") long hook and loop closures on chest and shoulder straps. Waistband adjusts from 810 to 1220mm (32 to 48") and may be secured in front or back, as appropriate for the user. Excellent piece of equipment. I wouldn\'t wish to be without it. Looks well made and is very comfortable to wear. 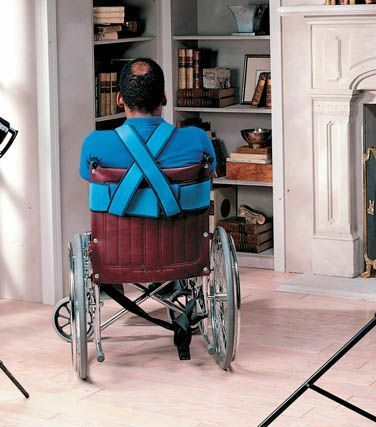 Can thoroughly recommend this wheelchair seat belt for anyone who has difficulty in sitting upright. The support it gives is ideal and is also comfortable. The unit purchased proved to be what was actually required for my father to remain in an upright position in the wheelchair rather than sliding down every few minutes. It is comfortable to wear and adjusts well to various types of users. I will recommend this to anyone wishing to purchase such a product. Thank you.